The first patent for a non-stick cooking spray was issued in 1957. Arthur Meyerhoff, Sr. and Leon Rubin, who started PAM® Products, Inc., founded Gibralter Industries to market the new PAM All Natural Cooking Spray. PAM actually stands for a Product of Arthur Meyerhoff. In the early 60s, a loyal user group was established through the introduction of PAM on local Chicago TV cooking shows. Carmelita Pope, a well-known Chicago personality, endorsed PAM and demonstrated its many uses. PAM quickly became a household word. The easy-to-use spray was widely regarded as the perfect substitute for sautéing with butter, margarine, or oils. With PAM's convenient no-stick formula, there was no longer any need to grease cooking or baking equipment with products high in fat. In 1971, Gibralter Industries merged with American Home Products, Inc., and the brand's national expansion accelerated. In 1990, American Home Foods (AHF) assumed responsibility for the brand. In November 1996, AHF was acquired by Hicks, Muse, Tate and Furst Inc., and C. Dean Metropoulos and Company. This became International Home Foods, Inc. In 2000, PAM was acquired by ConAgra Foods, Inc.
PAM has continued to evolve with the times. In 1985, PAM Butter was introduced, and one year later, PAM Olive Oil joined the product line. The 1990s showed the switch to Canola Oil for PAM Original, the lowest in saturated fats of all popular vegetable oils. In Fall 2003, PAM introduced yet another convenient spray, PAM Baking, which combines the unbeatable no-stick power of PAM with real flour. In the summer of 2004, PAM introduced PAM Grilling, which is specially formulated for no-stick at higher temperatures. PAM entered the Organic category in 2006 with PAM Organic Canola Oil and PAM Organic Olive Oil. PAM Professional® was introduced in 2008 and is specially formulated for demanding, high-heat cooking techniques. Today, PAM remains America's favorite no-stick spray. Through innovation and product introductions, PAM continues to be popular in households throughout the country and in fine restaurants everywhere. Preheat oven to 400 degrees. Lightly spray sheet pan with non-stick cooking spray. Place potatoes on sheet pan, drizzle with extra virgin olive oil, and sprinkle potatoes with salt and pepper. Cook about 30 minutes or until potatoes are tender. In skillet, heat two tablespoon extra virgin olive oil, over medium heat. Add turkey sausage to skillet, cook about 5 to 7 minutes, until lightly brown. Remove sausage. Add bell peppers, salt, pepper, rosemary and crushed red pepper. Cook until tender. Add sausage back to skillet, cook about 5 minutes. Enjoy! I love this kind of dinner. Looks like a wonderful dinner Christine. I love cutting sausage up and using a saute pan to cook it. Just so yummy. 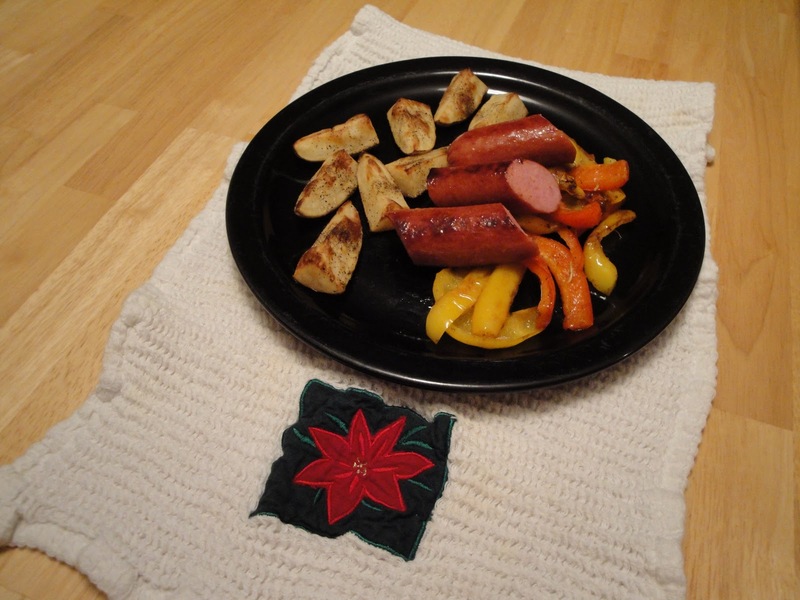 A great favorite of mine...turkey sausage and peppers! When I clicked on your name to comment back it did not bring me to your blog...had to type in the blog name to click to it! Gotta love the non-stick stuff! It's a friend in the kitchen! Thanks everyone, your comments mean so much to me. I was in Foodbuzz and clicked on your post, and I couldn't connect to your blog. So I went to Google.com and typed your blog name and brought me here. 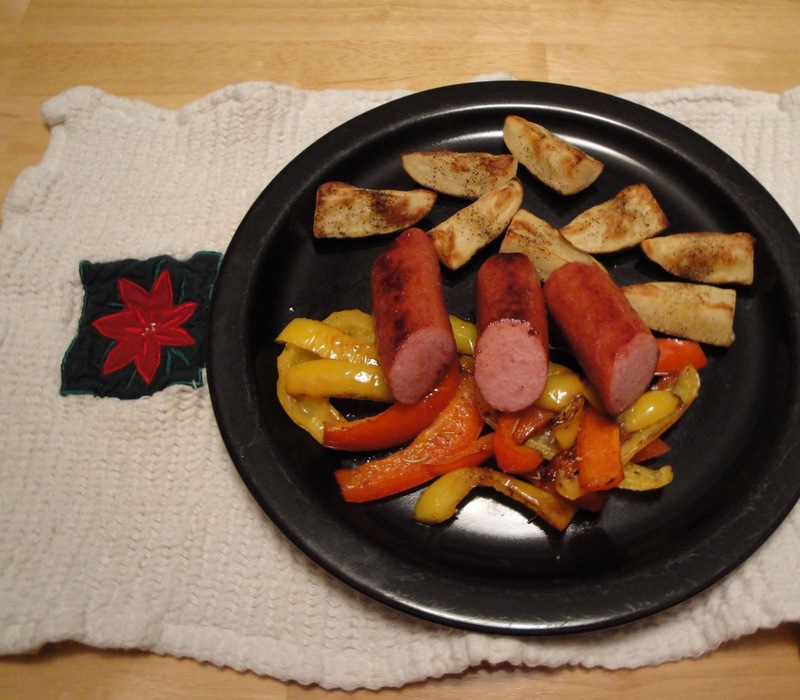 I love sausage and peppers. I LOVE Pam. I know it's synthetic chemicals, but it's such a great kitchen invention. Your recipe looks yummy! I had no idea Pam has been around that long! You come up with the most amazing trivia tidbits! Sausage and peppers is such a tasty dish and your plating here is a delicious reminder that I have not had it in a while. Interesting facts on Pam here-did not realize they had such a big line of products on the market now. Have a great day! Ha! I love random trivia - thanks for the info. I also love turkey sausage - great post.